Boatersland Marine is your source for discount prices on the repair kits and individual replacement parts you need to repair or maintain the Raritan marine toilet on your boat. 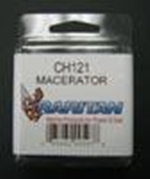 Maintain the Raritan reliability that has served boaters since 1958 with replacement parts such as the Raritan CH121 macerator shown here. By offering your choice of individual parts or complete repair kits, Boatersland Marine makes it easy to repair your Raritan marine toilet by getting exactly what you need, such as the CH121 macerator. Keep your boat’s plumbing in top condition at low prices with the combination of Raritan quality and Boatersland Marine’s discount prices and fast service. Boatersland Marine saves you time and money so you can get back to doing what you really love with your boat and get back on the water.